The life sciences field has a long and respected tradition of collaboration among researchers. Genomics as we know it today kicked off with one of the biggest biology collaborations of all time, the Human Genome Project. This has led to a highly cooperative mindset among many participants in the community, and it’s a mentality that we at DNAnexus share and embrace. A successful collaboration is more than just a mindset, though. It requires infrastructure of all sorts: today’s partnerships benefit from technology advances such as Skype, instant messaging, FaceTime, Google Docs, and more. These collaborations often involve many participants with a range of backgrounds and expertise, such as bioinformatics, medicine, microbiology, molecular biology, and more. The new DNAnexus includes a set of features to facilitate research projects for teams within and across organizations. As a bioinformatician, for example, you can upload your data, build Apps, create custom workflows, and then share all of it with your research partners, whose access and permissions you control. Because you have the ability to define the project and design the workflow yourself, your collaborators — who might be clinicians or biologists with little to no expertise in bioinformatics — will have easy access to the entire project via an intuitive web interface to analyze and visualize their data. With the new DNAnexus, you not only enable non-bioinformaticians to run your custom analysis tools and best-practice workflows, but you’ll also be able to eliminate data transfer, format conversion, and other incompatibilities that currently slow down even the most efficient collaborative efforts. This platform offers a secure and reliable environment through which you can instantly collaborate with team members without the hassle of data synchronization and shipping hard drives. Instant access from anywhere: When you’re part of a team that could be spread out across an organization, country, or even the world, you need to have easy access to your data from anywhere, at any time. The beauty of using a cloud-based platform is that it offers just that: peace of mind that your data will be ready and waiting for you whenever and wherever you need it. One of the main values of the new DNAnexus is collaboration support without the need to transfer files between collaborating sites. All the data is in one location and can be accessed by any permitted person from anywhere. 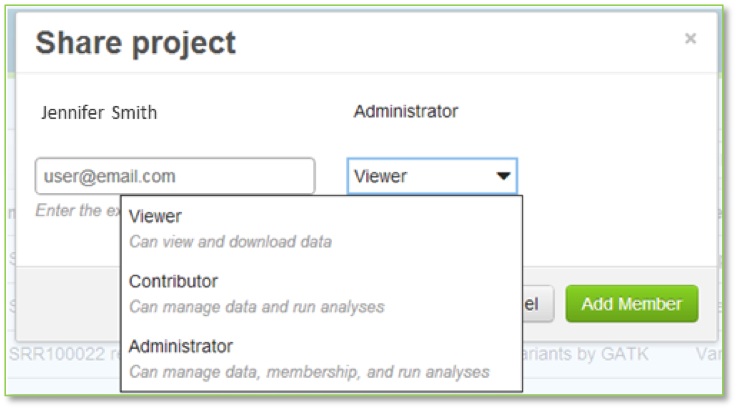 Intuitive permission definitions for users: As the project leader, you’ll be able to use the new DNAnexus to set access permissions for the other users of your project. Some people may be able to just view or download the data, while others can be made contributors, allowing them to manage and run analyses on the data — it’s all up to you, the administrator. Enterprise-grade data security: Just as much as you want the right people to have access to your project data, you don’t want other people seeing it. With its extensive background in data and cloud security, the DNAnexus team has built this platform with enterprise and user-controlled permission for data, analysis tools, and workflow sharing. Your data is not only stored in high-end physical data centers, but also fully encrypted at rest and in transfer. If you haven’t yet tried the new DNAnexus for yourself, what are you waiting for? Sign up here for your free beta testing account. And check back on this blog for our next in-depth look, when we will discuss security and compliance. Previous Previous: Recovering from AGBT: Exhausted but Encouraged ! Next Next: Join Us at Bio-IT World for a Personalized Demo and Chance to Win an iPad Mini!